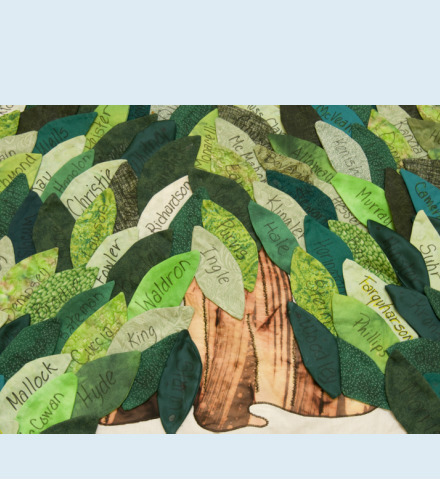 The banners were created for the celebration of the church’s bicentennial anniversary in 2005. 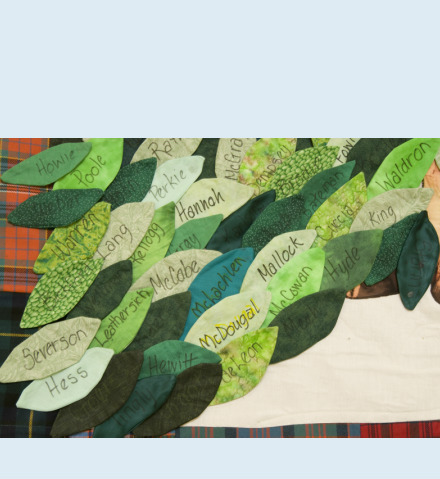 They are named for the charter members and bordered by that clan’s tartan. 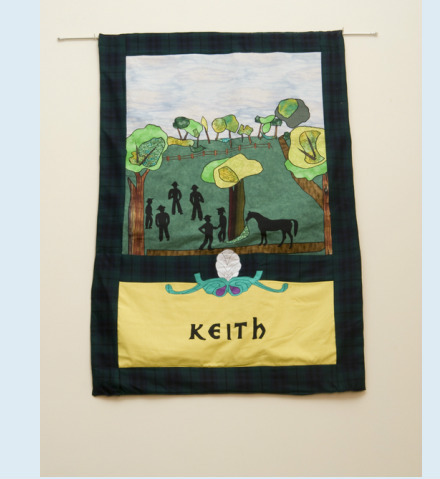 A gift from the Keith family underwrote the cost of the banners. The designs were created in watercolor by Marnie Barton. 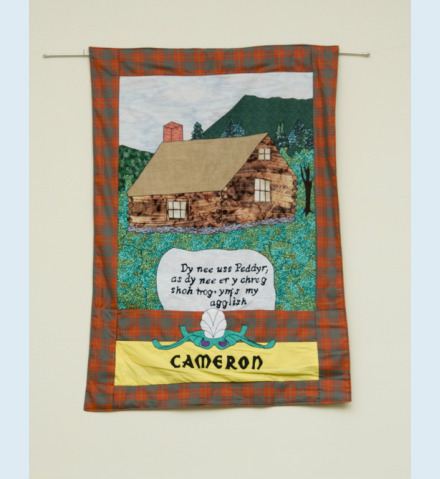 Fabric interpretation and creation were completed by Valerie Connor, Mary Drotar, Gail Hyde and Sue Mills. Keith Banner – The signing of the agreement between the five representatives of the settlers and Col. Williamson somewhere on the Corduroy Road between the Big Springs and Canandaigua. 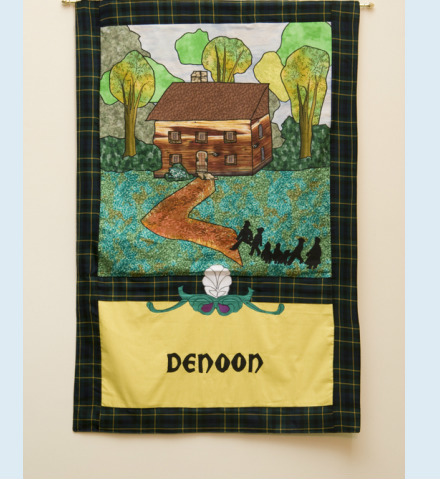 DeNoon Banner – An early family attending service in the log church which was completed sometime in 1809. 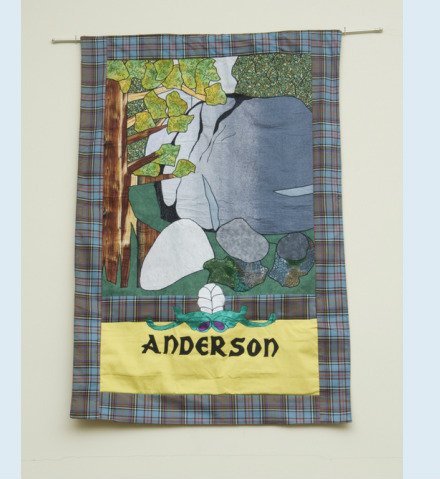 Anderson Banner – During the years from1809 until 1823, the congregation was locked out of the church building and so Peter Campbell kindly offered the use of his home for worship services. This is a depiction of the “Sabbath Stones,” granite outcroppings on the Campbell farm where legend says service was sometimes held. 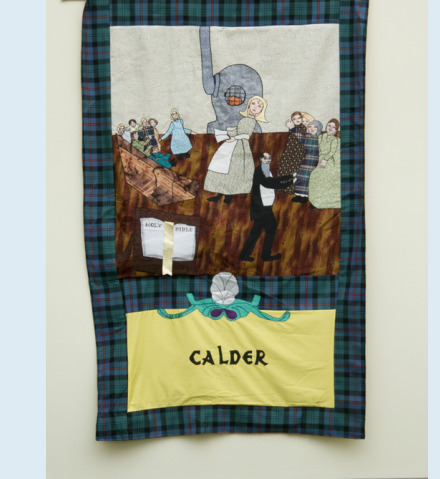 Calder Banner – During the 1820’s, Peter Campbell and Dr. John McPherson were instrumental in starting a Sunday school, which was open to any and all, who wished to study the scriptures. It was held in the stucco house across the railroad tracks on Center Street. 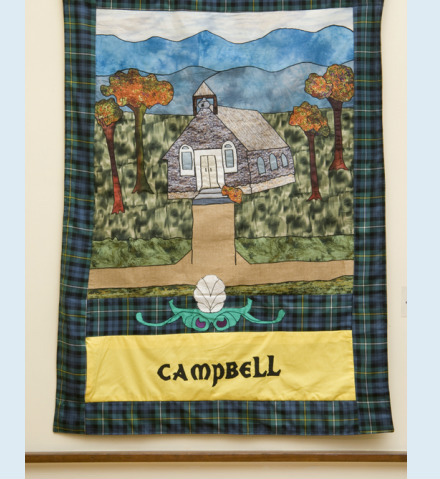 Campbell Banner – In 1827, a stone church was built on the site of the current building, which was donated by the Alexander McDonald family. It was the first real home that this congregation had in 18 years. 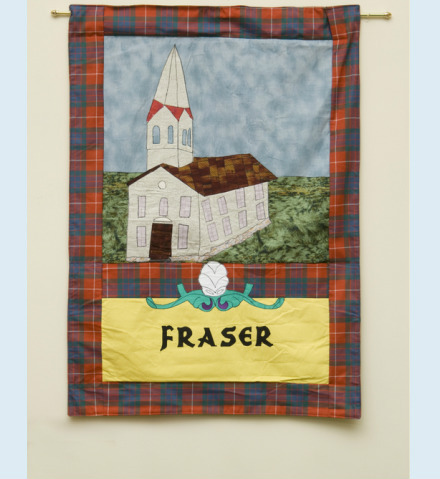 Fraser Banner – After a fire destroyed the stone chapel in 1854; this frame church was constructed on the same site. 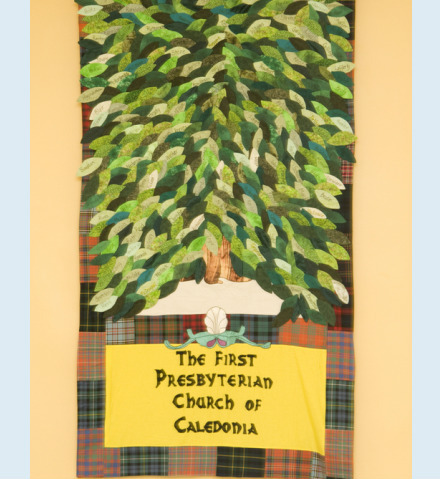 It is the present home of the First Presbyterian Church of Caledonia. 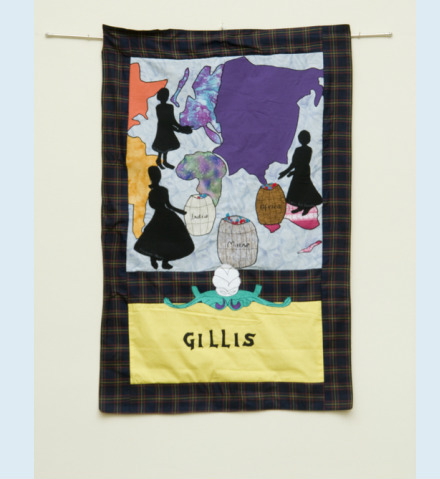 Gillis Banner – During the later part of the 19th century, the ladies of the First Presbyterian and the Associated Reformed Church worked together to organize a Ladies’ Missionary Society. This later evolved into the Presbyterian Women’s Association. This picture depicts some of the mission work that these ladies have done over the last 100+ years. 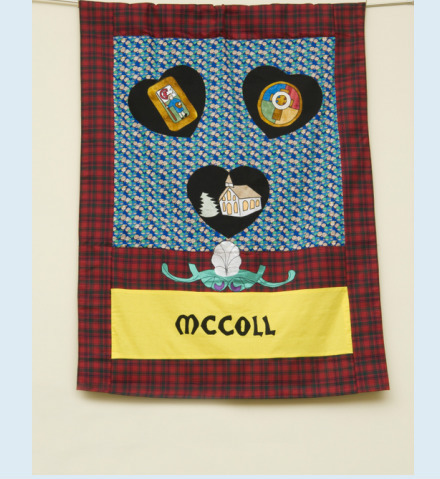 McColl Banner - The Rev. Barstow organized the first youth group here at FPC. It later became affiliated with Christian endeavor, and later still with Westminster Fellowship. 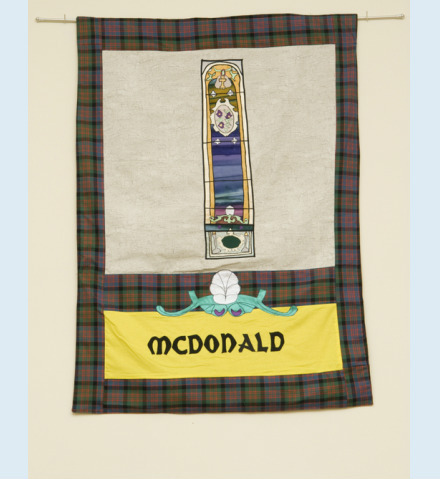 McDonald Banner – The middle window on the west side of the sanctuary represents the gift of the stain glass windows. These windows were donated in 1904 by the Menzie family in memory of their young son, Willie. 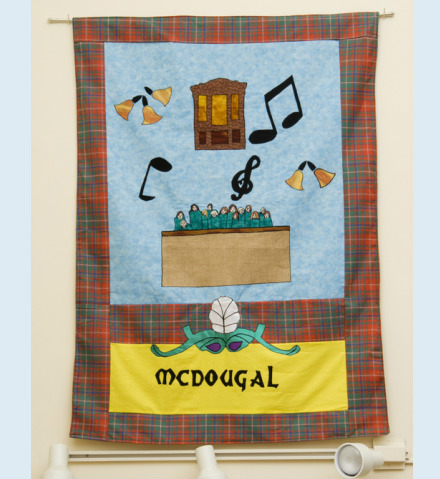 McDougal Banner – Our church has always been known for it's wonderful music program. Our wonderful Hook and Hastings organ was dedicated and installed in 1987, and partners with our chancel choirs and our bell choir to make a joyful noise unto the Lord. 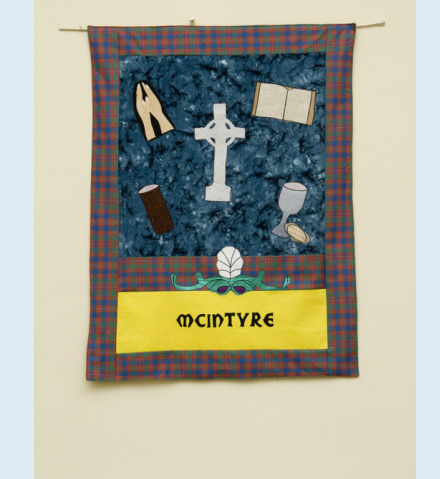 McIntyre Banner – The ministry of the elders. Baptism, the Lord’s Supper, praying hands and the scriptures surround our Gaelic cross. 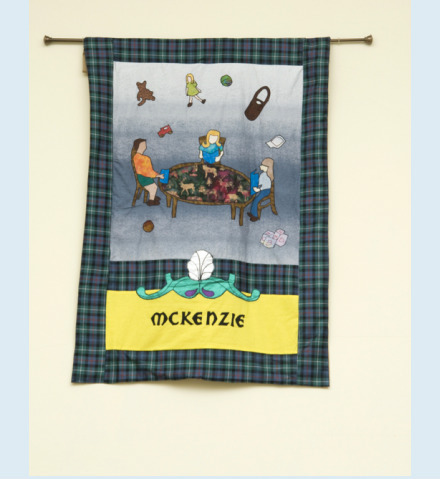 McKenzie Banner – Georgianna McKenzie was the force behind the formation of the Caledonia Cooperative Nursery School (now The Learning Tree) in the 1970’s. We also added some images to point to our Source Of Success ministry for at-risk middle schoolers. 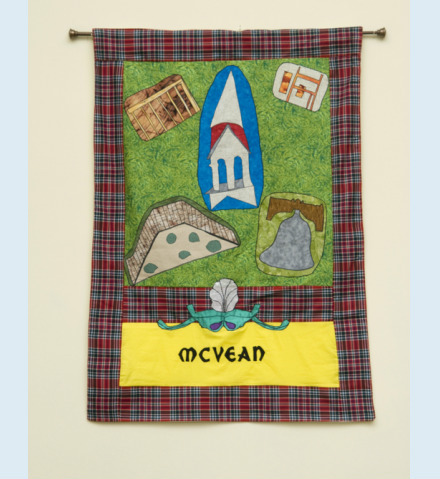 McLaren Banner – The ministry of the Board of Deacons. 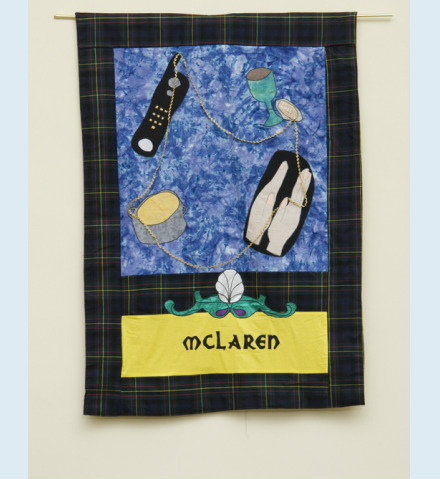 A golden chain of care and concern connects the phone tree, prayers, covered dishes to shut-ins and the preparation of the Lord’s Supper. 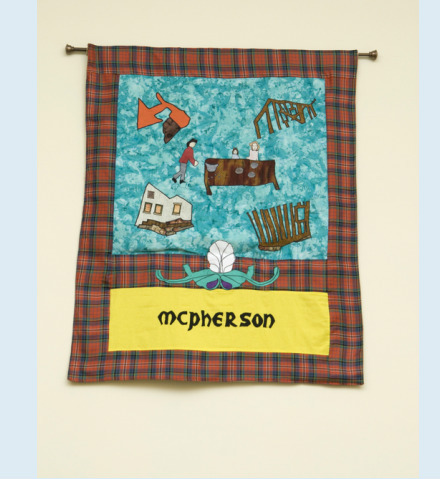 McPherson Banner - The construction of Fellowship Hall, from groundbreaking to cinder block being laid to the rough carpentry, and the celebration party held in the completed Fellowship Hall in 1955. 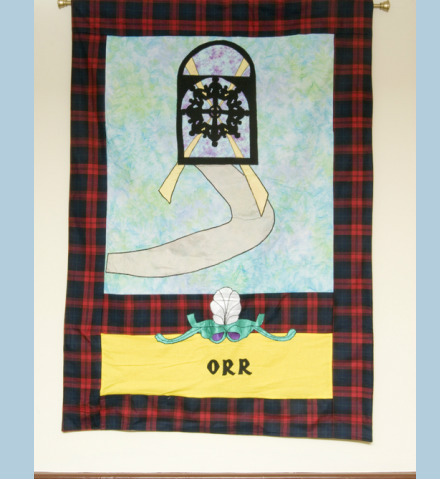 Orr Banner – The logo was designed by Alan Cutcliffe for our bicentennial. 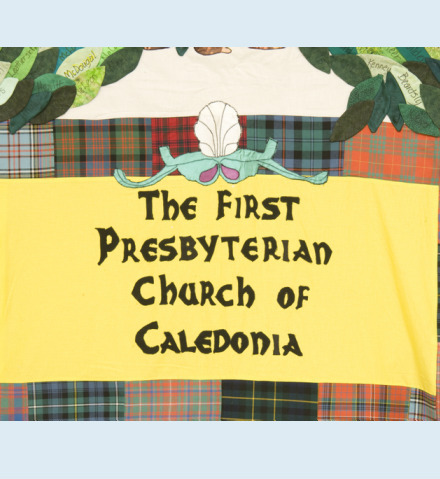 It is both a celebration of our past – the love, faith, fellowship and ministry since 1805 – and a look into the future as we begin our third century here at the First Presbyterian Church of Caledonia. 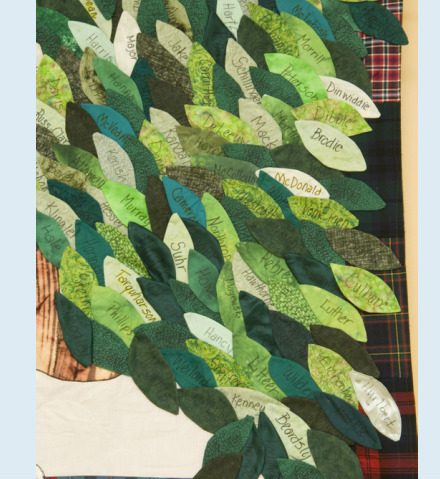 The Family of Faith – The leaves of the Tree of Life record the families who have been members of the First Presbyterian Church from our organization in 1805 into 2005.